We've recently talked at length about the new Audi R8 and the modifications brought to the table by the new model. 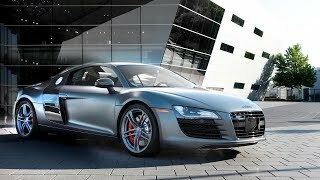 Fortunately for those of you who live in the U.S. the Audi R8 Exclusive Selection Edition 2012 has been announced by the German manufacturer. To be more precise, the Exclusive Selection Edition has been created exclusively for the U.S. market and the best part about it is that it comes with a handful of unique elements. Both the V8 and the V10 models will be available, although only 20 V8 and 30 V10 units will be produced for this particular market. Performance figures remain the same so the 4.2 liter FSI V8 will produce 430 horsepower at 7,900 RPM and 316 lb-ft of torque at 4,500 – 6,000 RPM. The 4.2 liter unit will reach 62 mph from a standstill in 4.3 seconds. The 5.2 liter FSI V10 on the other hand will deliver 525 horsepower at 8,000 RPM and 391 lb-ft of torque at 6,500 RPM and will be able to go from 0 to 62 in just 3.5 seconds. Both the V8 and V10 versions will be mated with a 6-speed manual transmission as a standard or an R-Tronic transmission as an option, whilst the highly-acclaimed Audi Quattro all-wheel drive system will deliver uncanny handling in the corners. Although technically the usual R8 and the Exclusive Selection Edition remains the same, aesthetically speaking the U.S. variant comes with a handful of differences. Not only that but in the U.S model there are a few things that sets the V8 apart from the V10 as well. Firstly the Daytona Gray brand new exterior color will be introduced for the V8 model. The new color will be contrasted by the carbon fiber diffuser and splitter, the black grille surround and the black exhaust finishers. In addition a new set of 19 inch titanium five-arm double spoke wheels will be introduced alongside a set of red painted brake calipers. On the interior the V8 comes with an exclusive leather package featuring Crimson Red stitching and other elements, a leather multifunctional steering wheel and exclusive leather navigation surround. The R8 V10 on the other hand will be delivered with an Ibis white exterior that contrasts with the Brilliant Black sideblade, rear license plate surround and side mirrors. Audi R8 GTtail lamps will enhance the rear end of the sports car and a set of 19 inch bi-color E-Tronwheels will further differentiate the V10 from the rest of the bunch. Inside, the more powerful model comes with Ibis finishes that contrast well with Alabaster White stitching. Carbon fiber elements end exclusive leather navigation surround further enhance the interior. 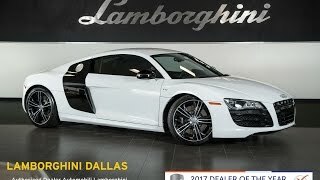 Pricing has not been announced yet but considering the fact that the Audi R8 Exclusive Selection Edition 2012 is pretty exclusive, it does make it a bit more interesting than the Chevrolet Corvette ZR1 or the Ferrari 458 Italia.